Artists usually specialize in one art form, but some artists thrive working in multiple – sometimes very different – disciplines. This month, we asked artists who work in multiple disciplines: What impact (if any) do the different art forms have on each other, in your practice? Like many writers, I spend way too much time stuck in my head. I could never maintain interest in the more usual forms of physical exercise to balance things out, but, living in Philadelphia in the early aughts, I took a few trapeze/aerial rope lessons and got hooked. Being upside-down and a little scared for my life really kept me in the moment! I didn’t think of aerials as an art form then, but neither did I expect to start performing professionally, or open my own aerial arts school. Beyond the sometimes-colorful names of moves, the real vocabulary of aerials is limited, tangible, and leaves little time to dither – unlike in writing, where I can gnaw for weeks on a paragraph with no hard stop, no blood rushing madly to my upside-down head. Writing is my escape from drawing. Both mediums allow me to create and explore narrative, but I am not an illustrator, and the fiction I write is often very different from my visual work. 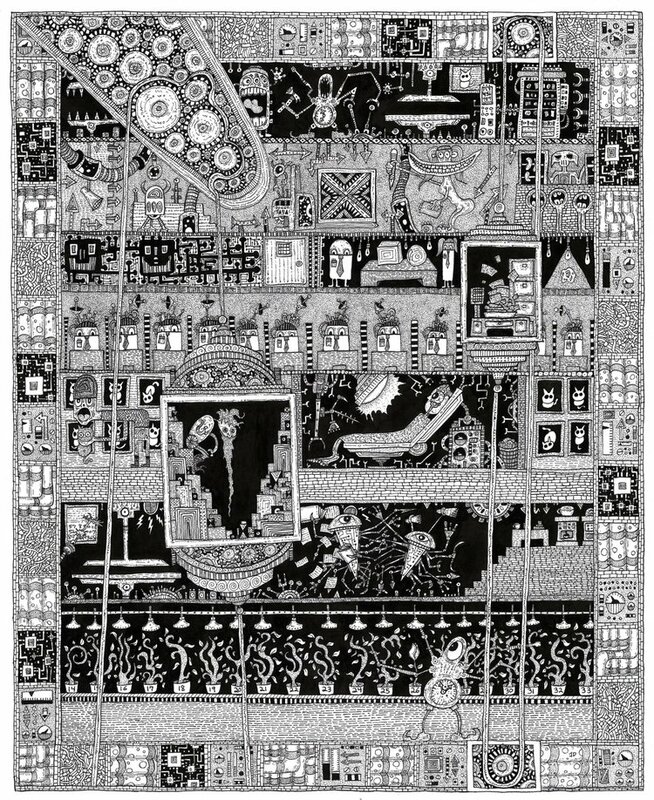 To me, the drawing is a story in itself and its mythology is developed in concert with the piece. The saying “a picture is worth a thousand words” has never seemed entirely true to me. After all, “the most beautiful painting in the world” can be conjured by those exact seven words. Of course, an image is always better seen than described, and in that way drawing has the advantage, but writing allows the imagination to explore without the cumbersome shackles of reality, and when the words tire or overwhelm me, then drawing becomes my escape from writing. Working in one medium allows me time to miss the other and return with a renewed appreciation. There are times when the demands of one force me to exclude the other, but during those periods I am gradually overcome by a sense of absence. Words summon images. Images inspire words. Neither can truly exist without the other and I find I need both in my life in order to feel complete. I started out thinking of myself as a writer, and wrote just about everything it is possible to write – poems, songs, stories, plays. At the University of Chicago, I started hanging around the library poetry room; it became my home, my retreat. For the next twenty years, I struggled to make poems that looked and sounded like what I wanted – and how they looked was always important. I needed that fractal geometry of cliff’s edge, that ragged right to complement the steady aligned margin on the left. By then, I was teaching writing in an art school, which got me free printmaking and drawing classes. Visual art for me came from a place that writing couldn’t reach – intuitive, explosive, messy, visceral. Occasionally, I’d scrawl some wailing words into the paint. Auditing performance art classes with a bunch of other renegade multi-media artists eventually sent me back to theater. I hoped that would take in everything I’d done before – words, images, movement – use what I had, make me coherent. Alas, it didn’t work out that way. Certain experiences seed themselves in me, want to grow into poems, nothing else. An inchoate feeling in my arms and chest wants to scribble and sculpt. And playwriting’s craftiest of them all, involves a crazy balance of plotting and planning, while at the same time listening for the voices of the characters, following them, not pushing them where I want them to go. The most important thing I had to learn as a playwright was that less is more – what’s enough in a poem is too much in a play. I’m giving the actors something to work with. Unlike in poetry or painting, I don’t have to do it all. James Dye is a visual artist and short story writer. He currently has a solo exhibition, Exploring the Myths of James Dye, at the Worcester Art Museum (thru 9/2). His short story “The Empty Room” appears in the most recent issue of Gargoyle Magazine. Jill Maio is a writer and aerial artist. She founded AirCraft Aerial Arts studio in Somerville (recently closed). Her writing has been published in Ploughshares, Virginia Quarterly Review, Alaska Quarterly Review, Third Coast, and Los Angeles Review. Monica Raymond is a playwright and poet who has also worked in an array of other art forms, including opera and the visual arts. Her poem Origami Blue is included in the spring issue of Redheaded Stepchild. 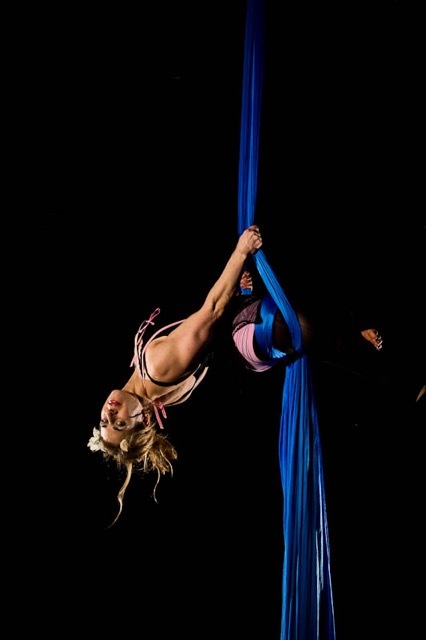 Images: Jill Maio performing as an aerialist; James Dye, THE COMPLEX, dip pen and India ink; Monica Raymond, MONOTHEISM, a work at the cusp of visual art and poetry. I am an author; a photographer; a painter; and a printmaker and I’ve worked in a combination of these since I was 15. Every day is a battle because three out of four of my loves have to be set aside to work on the other. Writing my recent novel, King & Train, I managed, with only a modicum of guilt, to set aside my other pursuits. When I was much younger, I made the decision to concentrate on only one of the above disciplines and, for me, it paid off. Nevertheless, the guilt of avoiding my other loves crawled around my mind each day. Presently, I work [ or try to ] each day on my third novel — but there are close to a dozen paintings sitting around that are waiting for me to come back to them. More than 100 new photographs sit in a file on my computer, waiting for me to work on them. 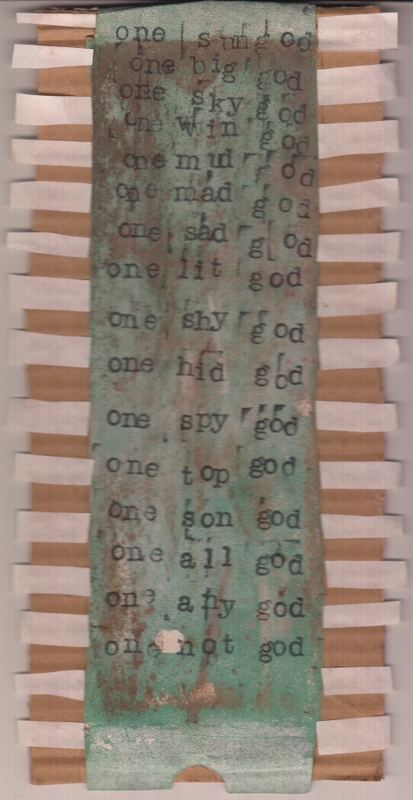 I’m in the middle of creating, for a Fall exhibition, a series of broadsides based on my poetry…… and on and on. I wake up frightened that I will not accomplish anything on this particular day; angry that I am not working on whatever is lying dormant while I write, paint, photograph; and maybe depressed because there just isn’t enough time. Over my lifetime, I have been creatively involved as a dancer, poet, visual artist. For years I did them separately. in 2016, I started teXtmoVes, a poetry/dance collaborative . I was feeling too compartmentalized and wanted to bring my work into an interdisciplinary format with two distinct disciplines which share rhythm, the search for shape, and a performative aspect. I wanted experimentally to explore their boundaries as well as their connections. and to work collaboratively with other dancers and poets. This creative move is the best I”ve ever made. I no longer feel as if I am neglecting part of my work to focus on another. I have even limited my work in sculpture to ‘homes for poems”. In these, each sculpture houses one of my poems or someone else’s; the visual form and the materials which compose it relate to the themes and form of the various poems. Poetry has become the center bringing my work as a dancer and a visual artist into an interdisciplinary focus., i don’t feel like a dilettante; I have real projects.